My Medium Reading with Amy Utsman was wonderful. She did an incredible job of pulling in details and messages from family members back many rungs of lineage, including personality descriptions, details, and messages that were true to the lifetime realities I experienced. She also picked up (accurately) many health related details for me as well as those of my relatives on the other side (upon their passing). Amy did a caring, detailed, professional job of delivering far more than I had even hoped for. I will certainly be referring my friends and clients to Amy whenever I am asked for a Medium referral. This was truly a very poignant and enlightening experience. AMAZING!!! I got a reading for my daughter for her birthday. She lost her grandparents recently and has had a life full of trauma and turmoil. Not only did Amy provide communication from both her grandparents, she gave her valuable information to send her down the right path for her future. We are so grateful for Amy’s honesty, integrity and use of her gift. She welcomed us in to her home and was so genuine and warm. 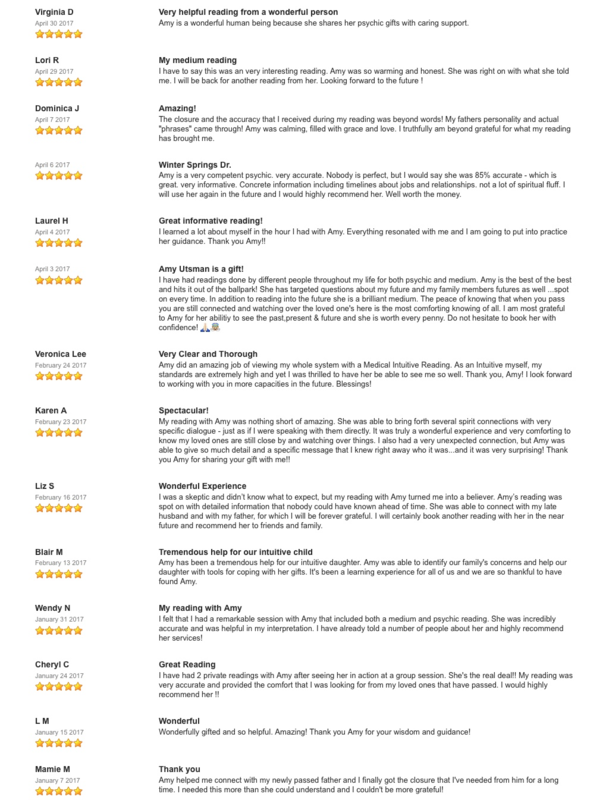 We would highly recommend Amy and her gift to anyone that is looking for a true experience. She is the REAL DEAL!!! We can’t wait to go back again… she will be our forever friend. Amy is the best medium that I have ever been to, and I have been to quite a few. I started seeing her after my husband died and she described him to a tee, from the symptoms he had to his personality. I was very comforted after my reading. Then my brother passed away and when I went to her for a reading she blew me away with details surrounding his death. She described the scene and even saw that it occurred on a boat on an island where they spoke a different language. I could go on forever with the hair raising accuracy of my reading. She is the best. She brought so much comfort by clearing up so much confusion about what really happened and giving me messages from my loved ones. I recommend her highly. I wanted to thank Amy for giving me such an incredible reading. A few months back I joined a group reading and Amy read me like a book. I could not believe how on point she was, so I decided to get a private reading. I was feeling really good about the direction in my life but at the same time a bit confused. She connected with my spirit guide and was able to help remove blocks within me that were preventing me from growing. I can’t explain in words how this has helped me take a new direction in my life. I could not stop thinking about my reading after it was finished. Once I got past the marvel I felt at having Amy confirm a lot of small details that she could not have known, I went back and listened to my reading again. It was so full of light, love, and guidance from my loved ones that I can only be thankful that they are still with me, albeit in another form. It was a truly amazing and enlightening experience and I left her high on a cloud of happiness, feeling I had reclaimed some of my child like happiness. My first reading was so great, I came back with my sisters so they could have the same experience I did. Once again, it was a wonderful, enlightening, and loving experience. You could really feel the love in the room and the support from those who have passed. It was also wonderful to be brought together as the three children of one family we are to experience this. Amy is highly recommended. Amy was right on the mark with so many details of relatives who have passed. No one could have known the things she was able to convey to me through her clairvoyance. I was so happy to hear from my son who passed recently and to know that he is doing well. Amy related things about him that only he and I would know. I highly recommend Amy as medium who has unbelievable and outstanding insights. I want to express my appreciation to you for getting my daughter back to me in June when she came to see you for a reading. For the 3 years prior to her seeing you, she always isolated herself in her room and often chose to be anti-social; disconnected. Every anniversary for [name withheld’s] passing or birthday was painful, emotional and debilitating. After seeing you and speaking with [name withheld], she received the answers she needed so she can have closure. Since that day, she has grown confident, outgoing, social, motivated, and cheerful. She is back to her wholesome self. I went to my reading very nervous and very skeptical, but came out with great PEACE. I had been struggling with the passing of my mother-in-law. Amy’s reading helped me put thing in perspective and helped me start on the path of accepting the loss but knowing my mother-in-law was still there for me. Amy shared things with me that in later months made me go WOW! She is such a kind and gentle soul and makes you feel so at ease throughout the whole experience. I will be going back to Amy many times. Thanks Amy, what a wonderful gift you share with people. I have had 2 psychic readings with Amy and both times I have felt an immense amount of peace come over me. The readings were very intuitive and accurate—and both times I have left with insight that I did not have. Amy’s readings stay with me for a few days afterwards and provoke a lot of thought because of how precise she is. That is how I know they are great readings… and I would recommend her to everyone. My medium reading was fantastic and amazing! Before my sister passed away, she was trying to tell me something. Because of her weak condition, I could not understand what she was trying to convey to me. Through my reading with Amy, I was able to receive the message my sister was trying to convey to me. Also, I was able to hear important messages from my mother, father, greandmother and a cousin. This is an amazing reality for my life! I am so grateful to have met Amy! She truly has such extraordinary skills to help people in such magnificent way! I was able to hear from my deceased mother who passed when I was very young and find out that she is in a good place and also get answers that only my mom could answer.. After the reading with Amy I finally found closure and feeling very much at peace now! Thank you Amy! I just wanted to send you a heartfelt THANK YOU for the reading this morning. I left your office feeling so happy and have had a smile on my face all day. You really helped me feel a lot better, get some closure, and of course some clarity in my life. Words cannot even express how grateful I am to you for being able to share your gift with me as I’m sure it’s a very draining process. My reading with Amy, Spirit Medium, was more than I expected! Not only was she able to channel my mother who had passed away when I was very young but gave me guidance for present and future concerns. I was amazed at the accuracy of her reading….things only I would know. As a reader, I feel Amy is a wonderful soul who wishes to use her gift in helping others reconcile with the past and set a clear course for the future. I would recommend her to anyone who desires to find peace and clarity in their lives. I hope to continue with her for more readings! Hi Amy, I like to thank you for the medium reading on Saturday. I feel much better now and don’t feel guilty anymore about my dad’s death. Will definitely contact you again to talk to my mom. Thank you very much for the wonderful experience. I’ve been going to tarot readers, psychics for many years but can’t compare with your reading.Thank you once again. — I am still amazed!! I had the pleasure of meeting Amy after my friends gave me a phone reading for Christmas 2013. Having been raised in the Christian faith, I was unsure how I felt about the medium reading. However, I had peace in knowing God delivered messages through angels, dreams & others. Amy replied, I only work in the light, I stay as far away from the darkness as possible. Amy did not know but when my late husband passed, my prayer would be that God would allow the light to hit the darkness & something new would be revealed to me each & every day. For many weeks this occurred & new details were made clear & visible each day. Left with a few scenarios, my friends suggested a reading to see if that clarity could be revealed. It was. There was key verbage which was very meaningful to me. The way she projected my loved ones personalities was spot on. She vocalized concern he had over his mother. I learned a few days after the reading (unknown to me) she had been ill & at the hospital. I am sure this was a complicated reading for her as I had a very complicated life. Amy sorted through it in a very professional manner and I was able to receive the messages from various family members with what I thought to be unusual clarity. I have no real words for what Amy does-wonderful, amazing, enlightening, fantastic, astonishing, just don’t seem to come near the gift that Amy has given me. I have always known there was something beyond this physical life and she confirmed it so well! When my youngest son died, I knew he was OK but to speak with him through Amy made my heart explode with joy! My dad even came through with a comment on something that I had never told anyone here on this plain of existence about. (he mentioned a miscarriage I had was a little girl and she was “fine” and I was not to worry – but I never told anyone I even thought I was pregnant!). I felt an immediate closeness to Amy, as if I had known her many years. Even over the phone, she is so kind and caring. She explains everything and answers any questions you may have in her soft spoken voice. I was immediately at ease with her and I can’t imagine anyone who would not be. I can not thank her enough for the gift she gave me- true peace, knowing without a doubt my son is doing fine, has loving family around him and is watching over us. I hope everyone contacts Amy, you will learn so much and be amazed! I would like to acknowledge Amy Utsman as an incredibly gifted psychic medium. I met with Amy twice this year, about eight months apart, and both times, she provided me with a deeper insight, clarity and understanding of the incredible changes taking place within my life. She especially helped me to realize the new direction that my life’s path would be taking me and to have confidence in myself and my abilities, in order to accomplish goals in this area. The messages she received in both readings helped to boost my confidence during a time when I was beginning to falter. Her continued guidance provided me with the confidence to complete a project that was so important to me. Thank you for everything Amy! Thank you for your reading last week. That was my third reading with you, and, as always, you were right on the money. You have such an incredible gift! I have many challenges ahead of me, and I can always count on your advice to help me make tough decisions. I have used Amy a couple of times over several years and found she was able to give me the most amazing details of my deceased relatives and in addition was able to help me with questions for my life that I was stuck on for which direction to go! I am pleased to suggest her for Medium or Psychic service. Amy, you are truly blessed. Thank you for sharing your gift. I would tell anyone who would like to have a session with you to go into it with an open mind and heart. Time spent with you can be truly transformational. I’ve had 2 phone readings with Amy a year and half apart. I am a skeptic by nature, until I hear factual information. They were both full of details from family members that only I would have known. Resolving unanswered questions regarding their names. passing, health warnings and completely answering what I’ve already sensed. They are still with us and watching over. Our sessions have also helped fill in some of the missing pieces of my genealogy search on Ancestry, which was at a standstill and keeps evolving! On the 2nd appt. for a medium reading. I had written a list of questions I needed answered and who I was hoping would come forward. Amy didn’t know this, she nailed it! She is warm, funny and wonderful in translating her communication from spirit to you. I always come away with answers. relieved, happy and recharged about life. I’m sure you will too! We came for a reading and left with so much more. Thank you, Amy, for sharing your gift with us. It truly felt like a blessing. Thank you for your honesty, patience and your insight. It was more than we expected. My one hour medium reading with Amy was unbelievable. I could of sat there for 8 more hours. It was enlightening and filled with so so much information. She was kind enough to spend even more time with me. Amy is great, sweet, down to earth and cool. I can’t wait to go again. I’m sending my daughter to her as well and anyone else that is a believer. Thank you Amy! I am very lucky to meet Amy. I had a medium/psychic reading with her. Amy’s soft voice and angelic personality made me to feel very very comfortable. She really has a gift. I got the answer for my lifetime question. I felt relieved and happy. I will recommend her to everybody. Thank you so much Amy. My reading with Amy was wonderful. She provided a steady flow of information from the moment I sat down. She had a uncanny sense of the personality and character of my loved ones and provided important messages that left me with a sense of clarity and relief that has eluded me until now. Amy is the “real deal” and ranks the highest of any reading I have ever had. She is bright, warm and caring. I will recommend her for sure. Thank you kindly once again for your guidance…your reading shed so much light and clarity to a lot of things that I have been wondering about for a long time. I mentioned to my sister in law what you said about moving stuff around to release stagnant energy and about her husbands own mind and she just looked at me awestruck like “how did she know that?” I was like “hello, she is s a true psychic! !” …lol..she was quite impressed at how you nailed our mother in law and cracked up quite a bit at how on point u were!!! Last but not least, my husband quit smoking just as you said he needed to. The rapport with you just felt very natural and comfortable….so I will have to agree with someone that wrote on your testimonials page that it IS like talking to an old friend…you were AMAZING!!! I not only felt absolutely comfortable when I got to Amy’s house the environment is so peaceful and serene, I loved her house and when she started conducting the reading I was blown away because she started having a regular conversation with me without using any other tools than the guidance from above – she spoke about things that only my loved one on the other side and my family would know; she is really amazing and such a kind soul – I highly recommend having a reading with her it’s really a unique experience. I look forward to the next time I get to spend some time with her. THANK YOU AMY! I had a reading with Amy back on July 23, 2009….To be brief, I came away from it very happy….Very uplifted. It was a blessed event as we were joined by a passed on loved one whom I’d really hope to connect with. There was also a mentioned a couple of numbers in reference to my creative/career path (which she was given but didn’t quite understand the how/why—nor did I)….Anyway, for the heck of it, I randomly played the numbers as a pick 3 lotto game the Saturday following the reading and well, I won on it which was pretty awesome to say the least. Anyway, Amy is a very cool lady, has a great personality, very patient etc…She definitely puts you at ease and the whole vibe is that you’re talking a good pal. The only downer of the whole thing was that time flies SO fast when having fun. An hour seemed to go by in the blink of an eye.